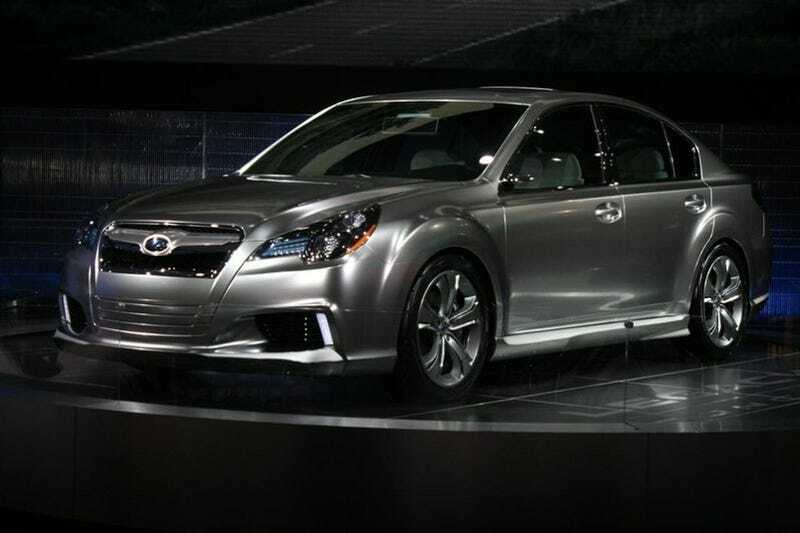 We've already seen the Subaru Legacy Concept here at the Detroit Auto Show because they left it all naked this morning. Now we've got complete details on this preview car from Subaru. Just like every other Subaru, the Legacy Concept with asymmetric all-wheel-drive to a 3.6 liter, horizontally opposed boxer engine. This concept looks to stretch the definition of a Legacy by adding a sense of "Dynamism" which the current car lacks. It grows in size a bit as well to accomodate the "Modern Family" (translated, "tubby 'Mericans"). Inside the interior bristles with touch screens throughout the car. In fact, almost all of the knobs and buttons are replaced with control surfaces doing everything from telling you how awseome your all-wheel-drive is functioning to distributing the quad-zone climate control. The headrests at the back get their own integrated DVD plater but not to be left out, the driver gets an enormous custom LCD screen which provides 180 degrees of back-end view. If we leave all theses show car add-ons out of the equation, this car gives a solid look at what Subie buyers can expect from the next Legacy. Marking the 20th anniversary of the Subaru Legacy, Subaru is proud to announce a concept model that suggests the direction of future Legacy Sedan design. The LEGACY CONCEPT has been developed to showcase the Legacy’s sporting capabilities and features Subaru’s Symmetrical All-Wheel drive system mated to a Horizontally-Opposed Boxer engine. Building on the Legacy model’s heritage of sportiness, style and reliability, the LEGACY CONCEPT is presented as a global mid-size sedan with interior space to fit four adults in comfort. The concept of the design is based on "Presence". A strong front design combined with a solid yet expressive body and a dynamic cabin work to express a rugged sportiness in the vehicle. Styling that highlights all four wheel arches emphasizes the reliability and dynamism of symmetrical AWD. Further increasing this sense of presence is the strength achieved by the design lines that carve out a substantial mass as they flow from the hood, across the roof to the trunk, while the sharp body lines project a sense of strength. This sense is especially apparent at the front of the vehicle in a grille that incorporates a wing motif showing the Legacy’s Subaru brand identity, and in the headlamps characterized by their sharp and elegant design, achieved though the dual vertical-row layout of the multiple LED lamps. In addition, the fog lamps set at both edges together with the bumper lines express a sense of powerful presence and also serve to clearly emphasize a unique Subaru authority. The door design features a sporty look while also providing high functionality through larger openings. Side Rear Vision Cameras are featured with a striking wedge shape to provide a sense of flow from the momentum of the A pillar lines. The LEGACY CONCEPT is finished in a special High-Luster color, called “Ultimate Silver”. This color which serves to enhance the strong design of the vehicle functions to create an overwhelming sense of presence, as well as provides the Legacy with an image of performance. The concept behind the interior design is "High Definition". A striking four-seat layout has been adopted in order to provide enough space to fit four adults in comfort and style. The combination of a roof design that provides a feeling of freedom with the expansive legroom delivers a vehicle that can be truly classified as a global mid-size sedan without losing its sporting pretensions. For the seats, Pearl White leather with a blue sheen has been adopted, while Black metallic leather has been used for the door trim to create a luxurious contrast with the instrument panel. The center panel features a large touch-panel display that concentrates the various functions to provide ease of use, while the adoption of a cylindrical-shaped design that extends vertically emphasizes feelings of strength and solidity in union with the exterior. A steering wheel and shift lever have been adopted to accentuate the sporty aspect that is elemental in the Legacy Sedan. The monitor of the Side Rear Vision Camera has been situated towards the front of the roof in order to maximize rear visibility. For interior entertainment, monitors with entertainment functions have been located in the center panel and rear surface of the center console, as well as in the rear of the front seat headrests in order to provide comfortable functionality as well a calm design that creates a relaxed ambiance for the four adult passengers. The Legacy was introduced globally in 1989, produced in Japan and Lafayette, Indiana and since that date until November 2008 the total global production has exceeded 3.6 million vehicles making it Subaru's core model. During that period, the traditional core Subaru technology of the Horizontally-Opposed engine and Symmetrical AWD have served to further improve "driving", "turning" and "stopping", the basic elements of automotive performance, and also continuously evolve features for unparalleled handling, stability, and safety. This LEGACY CONCEPT incorporates the Legacy heritage while also serving as a concept model that provides an image of the new driving comfort and reliability that will continue to serve as a touchstone for Subaru.